I’m not a huge advocate of giving pets as gifts, but I’m certainly guilty of it. So when I tell you Trixie’s story. allow me to lay my personal ground rules for giving pets as gifts. My friend Karen, who makes the collars at the French Dog Etsy shop, has French Bulldogs. Her mother had no dogs. For some reason, Karen decided that her mother needed a lap dog in her golden years, even though her mom had never expressed a desire for a dog. They live in the country, on a farm, and lap dogs are not practical things. Here is where we reflect on Rule Number One – know the person. Karen knows her mother well enough to understand what lies beneath the surface. So Karen searched and searched and found Trixie at a rescue. 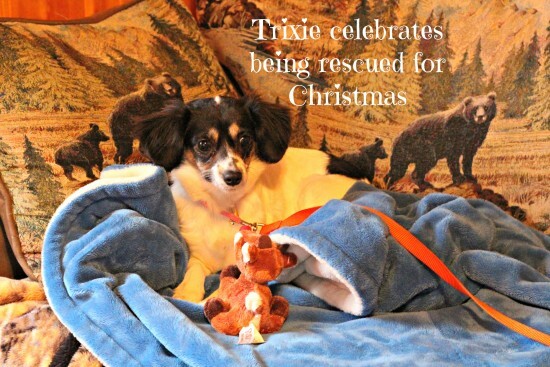 Trixie is the perfect size for a lap dog, but Trixie is extremely shy and is taking a long time to warm up. Karen had decided, before choosing Trixie, that she was going to adhere to Rule Number Two – be willing to keep the pet yourself. Trixie would come to her house to live if her mother said no. Fortunately, her mother fell head-over-heels in love with this pretty thing the moment she laid eyes on her. How could she not? But Trixie is truly painfully shy and reluctant. She took to hiding under furniture and not coming out. Mom was luring her out with sausage, with people food. So I decided that stronger measures needed to happen and I sent some Rabbit Entree’ Jerky from Jones Natural Chews, a welcome gift to this new family member. She’s still shy around people, and leery of dad, but follows mom everywhere (much like Louie). The treats have really helped her come out of her shell, and teach her that people aren’t bad. So in the above photo, the look you see on Trixie’s face is a bit of fear. Karen hasn’t spent much time with her, so she’s giving her the Look. She’s still nervous. But Does She Like the Treats? That might sound like a silly question to dog owners who’ve given their dogs Jones Natural Chews. They’re meat, for crying out loud. Dogs go insane for them. But shy dogs can be a different story, right? So I asked Karen about it. 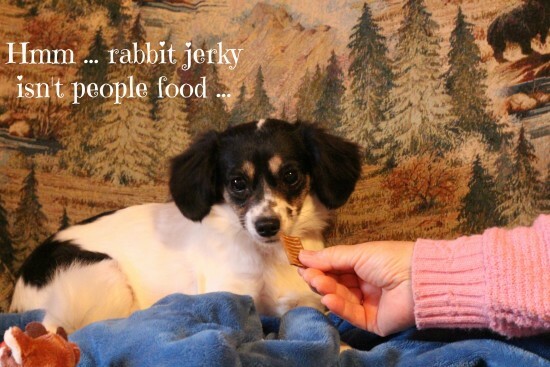 True story: she doesn’t like peanut butter flavored treats, but LOVES the Jones Rabbit Taffy. I’ve never had a dog turn down Jones. If you’ve ever rescued a shy, nervous dog, you’ll know that Trixie taking a treat from Karen’s hand is a big deal. She barely knows Karen. I’m so glad this treat helps her with her shyness. If you’re curious about my own story with giving dogs as gifts, click this link. I had to be ready and willing to implement Rule Number Three – now he’s part of our family. Now! 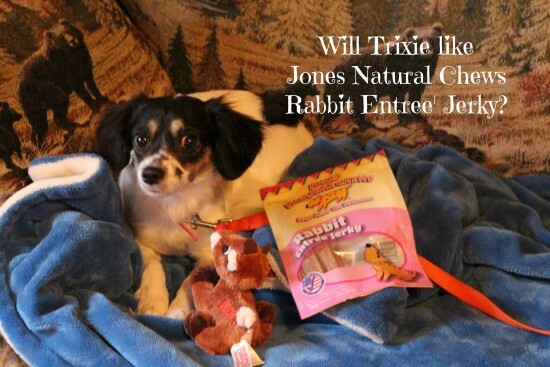 Your dog will also like the Rabbit Entree’ Jerky from Jones Natural Chews! In fact, we’re giving a bag away to some lucky dog, and it might be yours! Click on this sentence to take you to the giveaway page, complete with directions on how to enter. It’ll make your dog smile. Naturally.